Starting in 1929, weary travelers along the recently designated U.S. Highway 66, who arrived in the small Oklahoma city of Miami, received not only the usual hot food and lodgings but also a unique feast for the senses. When it opened on April 18, 1929 along Miami’s Main Street segment of Route 66, the Coleman Theatre was proudly billed as the most elaborate entertainment facility between Dallas and Kansas City. Local mining magnate, George Coleman, who conceived and funded the theatre, determined to give Miami--and Mother Road travelers-- the very best entertainment in the most modern surroundings. The Coleman’s Spanish Revival style exterior was a favorite choice of the Jazz Age, and this stucco palace is considered one of the best surviving examples in Oklahoma. In its heyday, the Coleman rivaled the Spanish Revival theaters found in the “big city” (Oklahoma City) down the road. Above the east, Main Street entrance is a dominating, curvilinear gable topped with three ornate finials. Underneath this gable are compound arched windows with exquisite, hand-carved terra cotta ornamentation. The east façade’s parapet wall with low relief carvings and a central spire-like bell tower are also trademarks of the style. Around the corner, hovering above the south, First Street entrance are twin bell towers with balconettes, wrought iron railings and red tile hip roofs. In order to diversify income, the design of the theatre’s ground floor included offices and shops along both Main and First Streets. Entering the theatre, contemporary visitors experience the treat of seeing a remarkable period piece. Restored to its 1920s splendor, the theatre’s gaudy Louis XV decor mightily competes with any entertainment program then or now. The interior offers intricate historical detailing, a fully restored original chandelier, and carved winding staircases flanked by gilded candelabra-toting statues. Opened in 1929, the Coleman Theatre still remains in business. In 1989, the Coleman family donated the building to the City of Miami. With the support of private and public funding, including a matching grant from the Federal Economic Development Administration, hundreds of community volunteers helped restore the historic Coleman Theatre. Even the old Mighty Wurlitzer, long thought lost, is back. 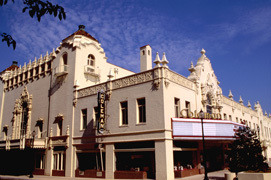 The theatre was listed in the National Register of Historic Places in 1983. 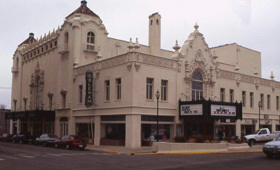 The Coleman Theatre is located at the corner of 1st and Main Sts. in downtown Miami, OK. It remains an important entertainment and commercial center for the community and is a popular stop for travelers along Route 66. The theatre offers free tours Tuesday through Friday, from 10:00am to 4:00pm, and 10:00am to 12:00pm on Saturdays. For hours and programs, call 918-540-2425 or visit the Coleman Theatre's website.